Upland bird season is here once again with grouse, partridge and turkey available to hunt starting tomorrow, September 1, 2015. 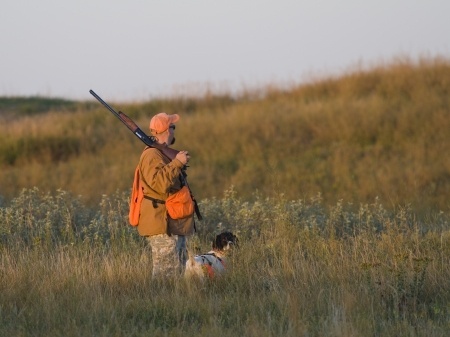 Pheasant season follows shortly behind, beginning on October 10, 2015. As you get ready to head out into the Montana wilderness, there are a few strategies to employ to improve your hunting techniques. Enjoy some time breaking clay in the summer months to hone in your shotgun skills and prepare for the upcoming season. Weekly practice will make aiming and firing at a moving target second nature and will let you know what is and isn’t in your range. Consider bringing your kids or grandkids along with you to learn. A youth-only pheasant weekend takes place on September 26 and 27 and is a great way to introduce them to the sport you love. Don’t forget to work with your dog throughout the summer months as well. Just like us humans, dogs are a little rusty on opening day. Make this season your best one yet by taking time to prepare both members of the team. Practice training drills and commands to get your dog in shape for your first outing, paying special attention to any areas your companion struggled with last season. Whether you keep a detailed, written report or mark points on your GPS, a hunting log is an important tool to look back upon to remember where you were most successful last season. After a few years using this technique, you will be able to see a distinct pattern that develops throughout the season. Try a few different locations to continue to expand your database and find your perfect hunting spots. Before you head out on opening day, review your facts and study up on the biology of the birds you plan to hunt. By knowing the plants they like to hide in and the food they like to eat, you will be better prepared to flush them out. Check each bird you shoot to learn what they had eaten. Keep a log of this information to better determine the area your next shot will be located. Hunting against the wind will also help you and your dog. Canines rely on their sense of smell to find birds, so approach good cover from downwind for the best rate of success. Read up on some more upland hunting advice with Bass Pro and Outdoor Life before heading out tomorrow for opening day. Interested in scheduling a big game hunt in Central Montana? Book your trip with Harris Hunts by calling 406-429-2800 or filling out an online contact form.